Two grey-haired wise men were going to face each other in mental strife. Would it be like one of those wizard stand-offs in the Lord of the Rings or Harry Potter? 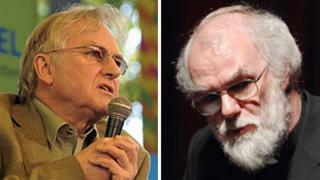 The Archbishop of Canterbury, Rowan Williams, was going head to head in a public debate with the leading secularist Richard Dawkins. The archbishop and the atheist were going to battle it out in front of a packed house at Oxford University's Sheldonian Theatre. In the end it was more Thought for the Day than Frost-Nixon or Frazier-Ali. It began with the air of an upmarket version of boxing at the Albert Hall, when the two contenders were led through the audience into the elegant, rounded amphitheatre of the Sheldonian. But it became a rather polite philosophical chess game, with the two opponents testing out each others' well-rehearsed defences. Did the archbishop really believe that the soul survived death? Prof Dawkins accused the church leader of fudging this fundamental question. "Yes, is the short answer," said Rowan Williams, before going on to give a longer one. The Archbishop of Canterbury pressed Prof Dawkins on the idea that humans were unlike other creatures in being able to reflect upon themselves and their own purpose. This "self-reflexive consciousness" had Prof Dawkins struggling for a comeback, admitting that it was "deeply mysterious". Prof Dawkins, who is appearing so often at the moment that he is more or less omnipresent, hit back with his own lines of inquiry. If the theory of evolution was correct, then did that mean that humanity had a non-human ancestor? Most likely, suggested the archbishop. Then what was the point of the book of Genesis, Prof Dawkins wanted to know. These were not literal narratives, but stories with deeper truths about the nature of humanity and the creator, the archbishop countered. The argument found its way to the inevitable question about why a caring God allows so much suffering, a question that Rowan Williams accepted did not have easy answers. The idea of a God in charge of the "micro-management" of events, but who didn't sort out the bad stuff of everyday life, troubled the archbishop. "I find that very difficult, if he can do that, why doesn't he do a bit more?" Prof Dawkins set out a world view without hidden glories. It was a straightforward process of evolutionary selection, played out over millions of years. There was nothing particularly special about the creatures on this planet, he argued, with the likelihood that the "universe was crawling with life". But the Archbishop of Canterbury challenged this human-centric vision of the universe, arguing that all our analysis of the accidental or divine design of life was seen through the narrow lens of our own human experience. It was a curious clash. After all the talk of militant secularism, this was more like a family fight between people who spoke a similar philosophical language. Prof Dawkins admitted to having found himself singing a hymn in the shower that morning. Prof Dawkins attacked religion for providing a "terrific illusion of design which fooled humanity into the 19th Century". But the debate was being played out in a donnish Oxford setting, with enough grey beards in the audience to thatch a cottage, that owed everything to such a "terrific illusion". So who was the winner in this spiritual wrestling match? A generation ago, it would have been the clerics who would have been wary of smugness. But now it was the atheists who had to be aware of their own glow of rather irritating infallibility. In that respect, Prof Dawkins played out the respectful disbeliever rather than the iconoclast. In turn, considering he is an archbishop, Rowan Williams hardly ever mentioned God. It was also a digital contest with an online audience. And looking at their respective Twitter accounts, Prof Dawkins might not be bigger than God, but he certainly has a lot more followers than @lambethpalace. There were no real knockout punches delivered, with God and the atheists leaving with honours even and without tempers being frayed. Up above the speakers, there were flying angels on the painted ceiling of this historic building. The painting shows truth chasing out ignorance. But whose truth?